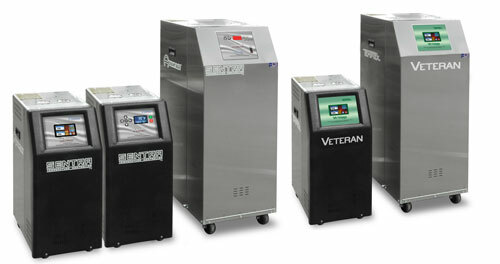 Water chilling units that can be moved to service individual applications within the facility. Air-Cooled and Water-Cooled portable chillers to 40 tons. Glycol chilling units for brewery, winery and distilling process. Air-Cooled portable and central units to 210 horsepower. Water chilling units to service plant wide applications. Air-Cooled and Water-Cooled central chillers to 200 tons. Fluid circulating units for temperature control. 30° to 250°F (water units) and 100° to 500°F (oil units). Fiberglass and galvanized ooling towers provide 85°F cooling water for machine hydraulics, water-cooled condensers, heat exchangers and other applications. Polyethylene or steel reservoirs with dual pump distribution system. Use with cooling tower or chilled water systems. Chillers Inc. is the exclusive Canadian Distributor for Logic Corp. which is the inventor and manufacturer of negative pressure temperature controllers.